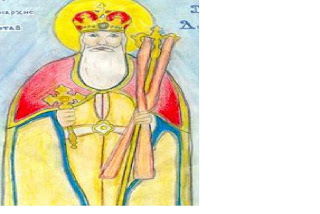 Dioskoros I (444-451 ) was Patriarch of Alexandria. He studied in Alexandria and held on for a long time coptic monks. Dioskoros was nephew and Archdeacon of the Cyril of Alexandria, whom he accompanied to the Council of Ephesus in A. D. 431. Dioscorus was in the Christological controversy of his time as a defender of the teachings of Eutyches. The Council of Chalcedon in 451Dioskoros put off, however, at the instigation of Leo the Great and the Emperor Marcian and rejected the results of the Synod.